We have been tracking our net worth for the past 23 months. Our net worth has grown by 21.3% since our first report back in March, 2015! That is an increase of almost $93,000 in less than 2 years. Think we can get to $100K growth by the time we get to 2 years next month? Of course, if we hadn’t bought a new car earlier this year … we would have increased our net worth by well over $100,000 already. Over the past 2 years (less the 1 month) … we have seen our assets start to really grow, while at the same time most of our liabilities decrease. The only time our liabilities actually went up was when we took on the debt of our new car payment. 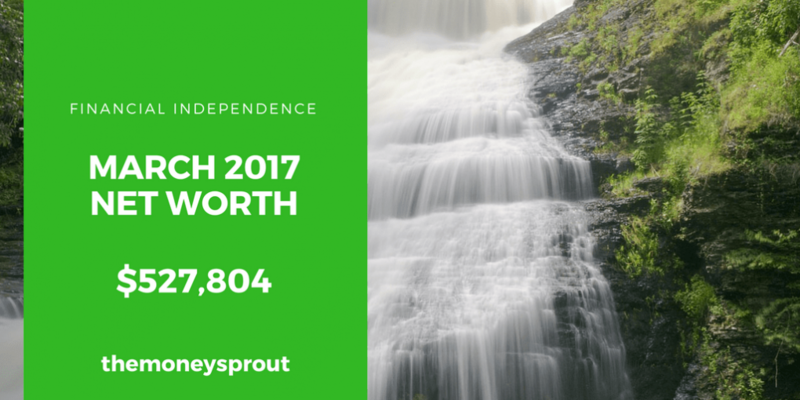 As of March 23rd, 2017 – our net worth is $527,803.85. In past years, we didn’t want to post net worth updates every month. Instead we opted for posting updates every 2 or 3 months. Since there are so many moving parts to calculating ones net worth, it seemed pointless to me to go through the exercise every month. However, things change … and now we plan to provide an update every month. So how come we changed our mind? We have been really trying to focus on saving a lot more of our income each month in order to invest it. By reviewing our net worth once a month, I feel that it will help us stay motivated with our goal to save (and invest) more. Here is our most recent update, compared to our last net worth post in February. Our net worth in March 2017 increased by a modest 0.55% compared to February (2017). That is an increase of over $2,500 in just 1 month. This month, the increase was evenly spread out between assets and liabilities … which is something I like to see. We currently have 3 main asset categories that we are reporting on – investments, cash, and home value. We don’t like to report our automobiles as an asset, so those are only included as liabilities. The stock market had been on a tear lately, so a ~$900 increase in one month may seem a little disappointing. However, even though things have slowed down a little in the market … we continued to grow our investments! The value of our investments rose by 0.22%. We saw a big drop in our cash since last reporting. The biggest reason for this was that we paid our annual home owners insurance and insurance for my new car. We hope to increase our cash starting next month. A nice increase in our home value … although it is simply a figure on paper. Overall, 2 out of 3 assets we report on (home value and investments) saw increases. Our cash took a hit in order to pay off several large expenses. Total assets rose by almost 0.22% since last reporting. My old car died … so we ended up buying a new car that gets great gas mileage. I commute about 60 miles per day to work … so I need something that doesn’t waste a bunch of gas. While my wife and I didn’t really want to take on additional debt, it was time for me to replace my old car as the ongoing maintenance costs were rising. When we first took out our mortgage, we had paid extra money towards our principal each month. Usually between $100 and $300 a month. However now, based on our low interest rate, we opt to put this money to work for us in the stock market. I like to think we can earn a dividend yield higher than our mortgage rate (4.375%). As far as our other “family car”, we have a very low rate and are on year #4 of the loan. We refer to this as “car loan #1”. Since our rate is 1.56%, we haven’t really considered paying extra on it. We would rather take any extra money and use it to invest instead of paying down this specific debt. The balance on both of these loans should drop a decent percentage each month going forward … especially loan #2 since it is 100% principal. Our credit card balances fluctuate a lot month to month. Since we pay off the balance on our cards every month, lowering the balances doesn’t save us any interest, etc. It is just a reflection that we are spending less … which is what we want to see. I never like to see our liabilities increase. Over the last month, we have lowered our liabilities by (0.59)% … which is a good thing. As I like to point out every time we talk about net worth … there are 2 sides to the equation. So a decrease in liabilities by ~$1,200+ is just as important as increasing our assets by the same amount. After reviewing our net worth number for this March, it was nice to see growth in most of the categories … not just investment gains. Our credit card spending, mortgage, and car loan principals all dropped. No surprise there, but we need to continue this trend. As far as assets, our investments continued to grow … although not as fast as previous months. Finally, our mortgage value saw a modest increase compared to last month. The only category that we dropped was our available cash.